Vintage Gyprock | Sydney House. During the plastering process, we have decided to strip the original P&S lounge/dining room. It’s about 34sqm and needs to flow through to the new section. 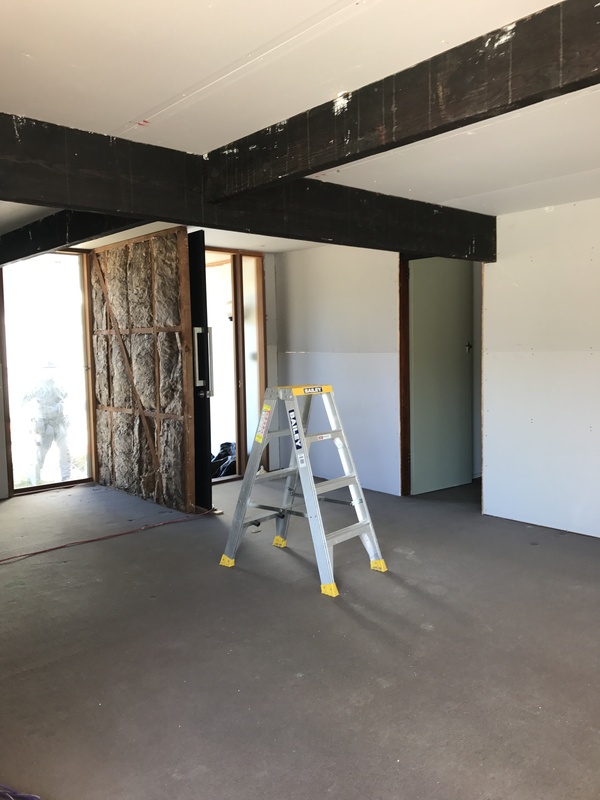 It’s got new doors and the opening to the new section but now it needs the timber flooring which will connect the spaces. To do that, we need to get the plaster off, insulate and then put new plaster all back on. 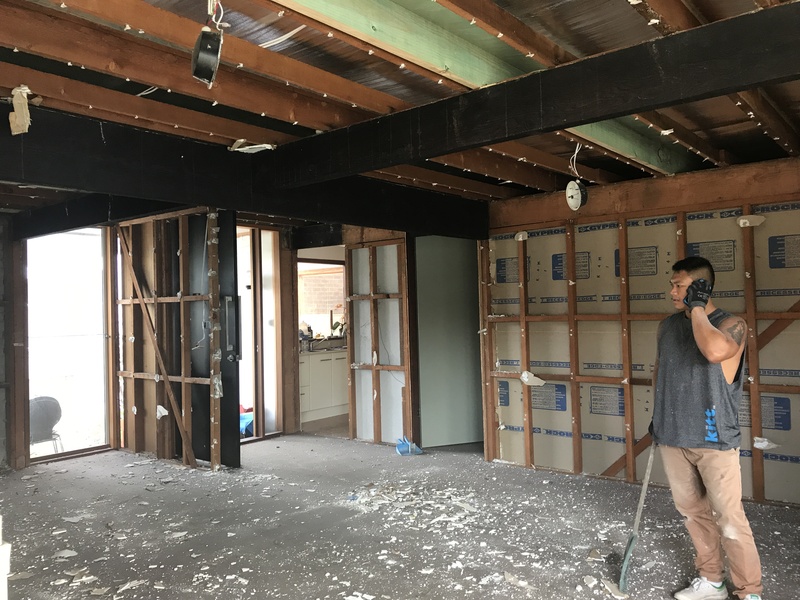 Meanwhile the house is expanding around us but the usable space is shrinking …we’re confined to 3 bedrooms, a bathroom and the kitchen…nowhere to sit! Fortunately, we got this done quickly and will soon be able to stretch out to the new areas once paint and flooring is in. 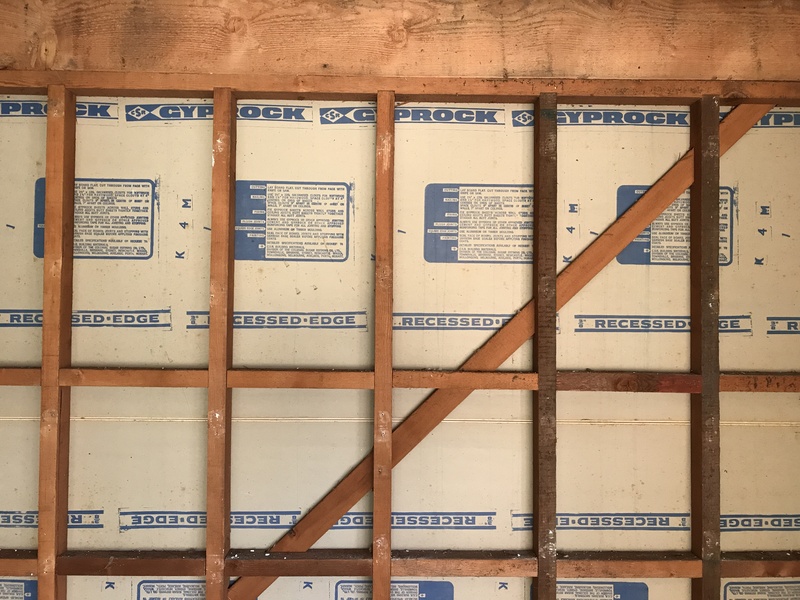 Taking off the plaster in the lounge/dining on this wall revealed the 1964 Gyprock on our still-in-use master bedroom! Absolutely zero insulation in the original P&S. Removing the nails from every one of the old beams was painstaking and required a special tool. View to the front door…oddly the front door comes straight into the lounge room – a feature we never liked because it always felt like you could see a messy room from the doorway. Timber floors and spreading the living areas will solve this. The original galley kitchen will only be taken out once the new kitchen is functioning. 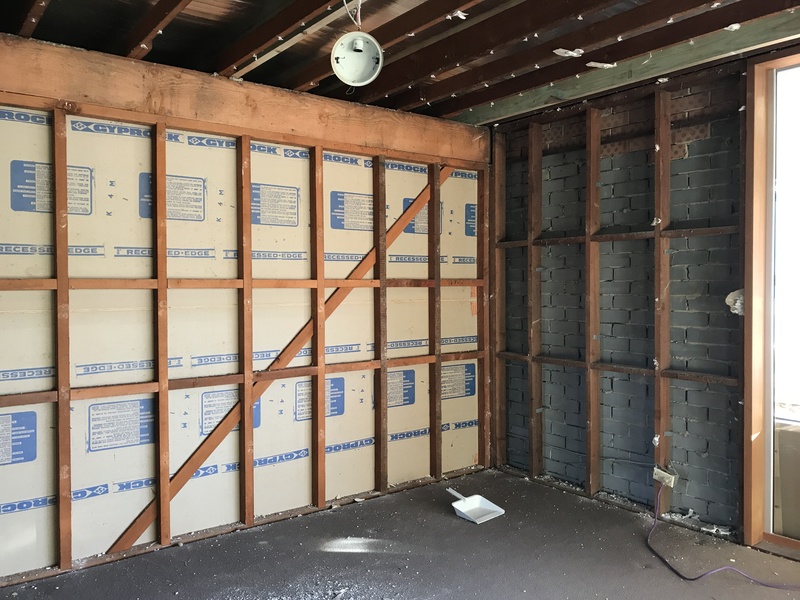 Presto, the new sheeting is up and the walls include insulation. Our Gyprock team had a slight challenge wedging the boards back above the beams but they did it. The beams will certainly need some love and re-oiling/staining once plastering and painting is done. The kitchen has been closed off as it will eventually be a bedroom stud wall on the other side. For now we have to use the kitchen, via the hallway.